Root canal treatment or root filling is performed when a particularly large cavity has affected the nerve chamber of the tooth. 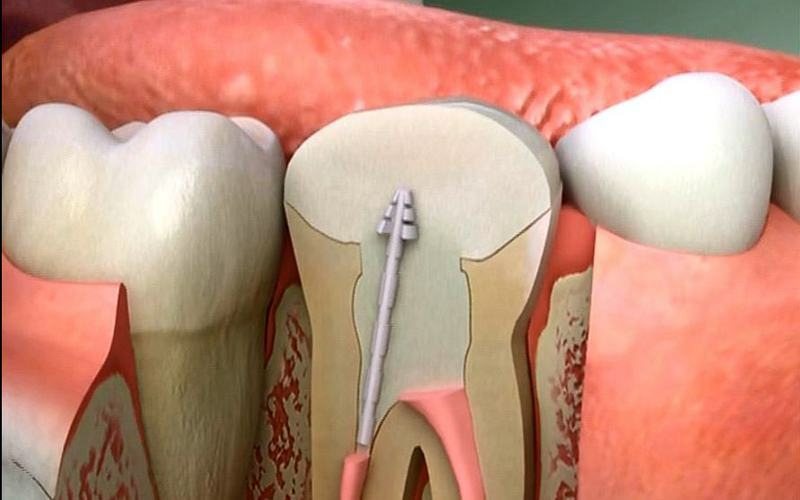 Under this treatment, your dentist will remove the dead or damaged nerves in the root of the tooth. The empty space is then filled with sealing material. After getting this treatment, our dentist will fit the affected tooth with a crown. The root canal treatment may also be required if a broken tooth has an exposed nerve. Exposed roots can become infected and may need to be removed. Alternatives to root canal treatment include extraction of the tooth/ teeth and replacement with dentures, bridges, or implants. The advantage of getting a root canal treatment is that it allows you to retain your natural tooth. There are many people who are scared of the root canal treatment. With dental clinic name, there is absolutely no need to panic. The entire process is done under local anaesthetic and you wouldn’t feel a thing. The root canal treatment is usually done over two or three appointments. The following processes are involved in the treatment. The dentist will drill a hole in the tooth to gain access to its nerve chamber. This allows them to clear the infection and remove the dead tissues. After performing this cleaning, the dentist will fill the tooth to ensure that it does not get infected again. You may experience some mild discomfort after the cleaning. However, once the treatment is complete, your teeth will not become infected again. Our expert dentists can save your teeth with root canal treatment that cures the infection and heals the tooth. After completing the process, you will be able to bite and eat as usual. Interested in retaining your natural teeth and getting rid of pain and sensitivity? Contact us to learn more about the treatment options. Join us for the best smile possible. We proudly are a family owned Dental clinic. This means you matter to us. We provide a better treatment, and dentists that really care about your dental health. We are the preferred provider for HBF, Medibank, nib, HCF and CBHS. This means you get top quality dental care for less out of pocket expense. We also support you if you are a Medicare Subsided patient, a child on the Dental Health Benefit Scheme and Department of Veteran Affairs patient. We are located in North Beach, however we happily serve people in Carine, Marmion, Sorrento, Watermans Bay, Trigg, Hillarys, Duncraig, Karrinyup, Scarborough, Warwick and the Perth area as a whole. Call us on (08) 9447 1514, or visit us in our office at Unit 2/118 Flora Terrace in North Beach to see how we can help you.